LotFP: RPG: LotFP ANNIVERSARY CONTEST #2! On July 22, 2009, LotFP officially became a business. In July 2010, LotFP published its own game system, Weird Fantasy Role-Playing. 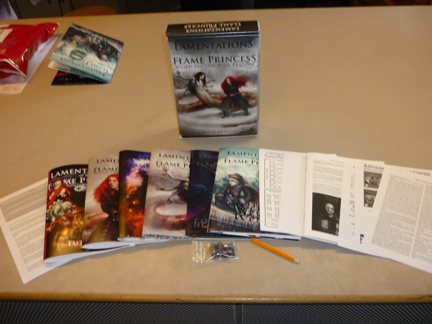 The first printing, the Deluxe Edition box, quickly sold out. Then there was the Grindhouse Edition box, and while there are a couple hundred still knocking around the distribution chain, I've sold out. There will soon be a Rules & Magic hardcover, to be followed by a new hardcover Referee book. Anyway, I still have two of those old Deluxe Editions knocking about. They have a price tag on them, and they were on a store shelf (I traded the newer Grindhouses for the store's old copies of the Deluxe Edition so they didn't have the older edition rotting on the shelf), so they're not pristine. But they are complete and unopened, with a Rules book, Magic book, Referee book, Tutorial book, Recommended Reading booklet, Tower of the Stargazer, and Weird New World. Plus dice, character sheets, graph paper, and a PENCIL! Send me a writeup of a MONSTER of your creation suitable for LotFP by July 21! And I'll release a free PDF featuring what everyone's submitted sometime thereafter! What does "suitable for LotFP?" mean? Well you've seen Better Than Any Man, The God that Crawls, Monolith, Tales of the Scarecrow, and Death Love Doom. That sort of thing. To enter, send an email with the subject line LOTFP MONSTER CONTEST to lotfp@lotfp.com with your monster, the name you'd like in the credits, and any web link you want printed with that. You retain all rights to your creation but you give LotFP permission to distribute your entry in the free PDF. You also should realize that while I won't change your entry's content, I may put my variation of the monster under yours (clearly marked which part is mine and which is yours). On July 22 I'll choose a winner and contact them by email. You have 48 hours to respond to that with your mailing address or I pick another winner. Also looking for someone to proofread the thing, and someone to do a color cover for it (can't pay for this sort of thing since it's a non-commercial project). There is also a Magic Item contest happening. Oh, and just so you're not getting an old collector's item that's out of date for actual play, I'll throw in a new Rules & Magic hardcover with the Deluxe Edition box... for both contests! Talking About the New Releases! Tons of LotFP Releases OUT NOW! LotFP 2013 ENNIE AWARD NOMINATION! Better Than Any Man out now in PDF!